There was nothing in the early boyhood of Anura Srinath to suggest that he was in any way unusual. He was born on September 6, 1957 in Kirillapone, Colombo. His father who was a clever, spinning and weaving machine operator was a talented artist. He was reputed for his artistic creations turning out beautiful designs on paper or wood and during the Vesak season he made colourful pandals. As a boy Anura grew up in the typical surroundings of a home full of sketches of temple paintings and traditional Sinhalese art forms. He was fascinated by these drawings and paintings from childhood and expressed his desire to become an artist. But his father M.S. Perera had no intention of making his son an artist. He called his son young man and said “young man, think of the future!”. “With genius you die, with money you live!” So he wanted his son to become a doctor. Anura started his education at Lumbini Maha Vidyalaya, Colombo. He studied up to the Advanced Level in Science. But his talents with the brush and paint impressed his teachers as a schoolboy artist. Anura came under the tutelage of a reputed art teacher P.A. Leelaratne who moulded him to become a perfect artist. 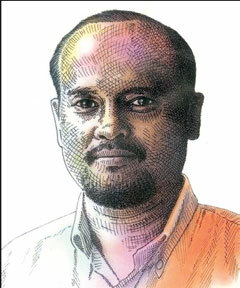 After leaving school he joined the Upali Group of Newspapers as an illustrator, from there on he become a rolling stone. He went from one firm to another, and worked in leading advertising agencies in Colombo. By now his name was established as an excellent illustrator for picture stories, designer of book covers, cartoons and T.V. Commercials. He mostly worked with pastel, acrylic and oil. His paintings aim to please the eye. Anura's paintings create a sense of curiosity. They are distinguished by a certain mystery and pushes the viewer to think about the story that the image is trying to convey. His paintings depended on masses of colour, working from black to tints of the deepest luminosity with high colour values. He is a wildlife painter who spends his free time visiting wildlife parks. His favourite subjects are elephants, leopards, lions, and deer. The picture titled “looking for a prey”, ‘fisherman set out for a catch’, and the bright coloured scene of ‘horses after the races’ show the balanced distribution of light and shadow to produce a perfect harmony of colour. Anura is interested in the commercial aspect of his art. A few master strokes from his brush and the painting could command the very highest price. His cordial relations with leading commercial establishments, and State departments, has won him accolades for creative achievements. Anura's art moved quickly towards digital painting and creative art, which eventually entered the world of common visual experience. He got engaged largely with paintings in which the design was mostly drawn in lines technically which gave the effect of engravings. Beautiful as many of his pictures are, in which the subjects are described by delicate precise lines in flashy bright colours. 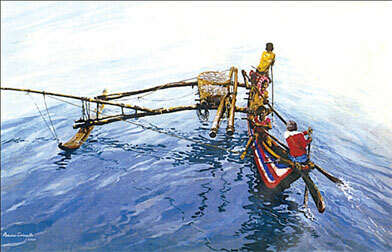 He had a successful display of his work recently at the Colombo Art Gallery which paved the way for bigger assignments. His creative designs using techniques and photoshop software added glamour to suit any concept and requirement. Besides Anura's dedication to painting and drawings, he engaged in other activities too. As a nature lover he finds inspiration from wildlife and traditional architectural buildings. In a need to get away from the hustle and bustle of life in Colombo, he visits bird sanctuaries at Yala, Sita Eliya Forest Reserve and the Sita Eliya Sanctuary. His love for old architectural buildings is evident in his latest display of work at the Nupe Old Dutch Fort, in Matara which is now on. Anura's attempts with the brush and paint at the exhibition will surprise all art lovers.